17 ▾ ▾ ▾ PracticeLink Live! puts you face‑to‑face with your future. t he advice you need, the jobs you want. 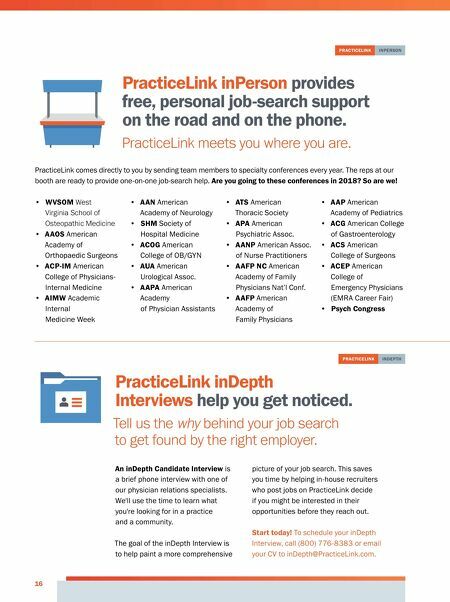 Our exciting road tour of physician career fairs and job-search seminars is coming to a city near you! Don't miss this once-a-year, physician- friendly event— the best place to learn how to navigate your job search and connect with representatives from hospitals from across town and across the country. Free dinner and free parking make it easy to attend! What to expect at PracticeLink Live! Physician Career Fair. Looking for your next practice? Or are you ready to simply explore all the options available when you do start looking? Meet hiring employers from both across town and across the country! Seminar: When to Do What in Your Job Search. When should you start your search? How can you negotiate a signing bonus, student loan repayment and more? What do you need to know about visas, relocation, contracts? Come to the free seminar— stay and ask our expert panel your specific questions! Networking Opportunities. Connect with dozens of hospital representatives, and get all your job-search questions answered! Plus, enjoy networking with your fellow residents, practicing physicians and advanced practitioners at this professional yet fun free event. Premium Food and Drinks in a Casual Atmosphere. Don't worry about squeezing in dinner. We've got you covered! Enjoy premium food and drinks as you network with recruiters and colleagues. Come however it's easiest— scrubs and families are welcome. Start today! 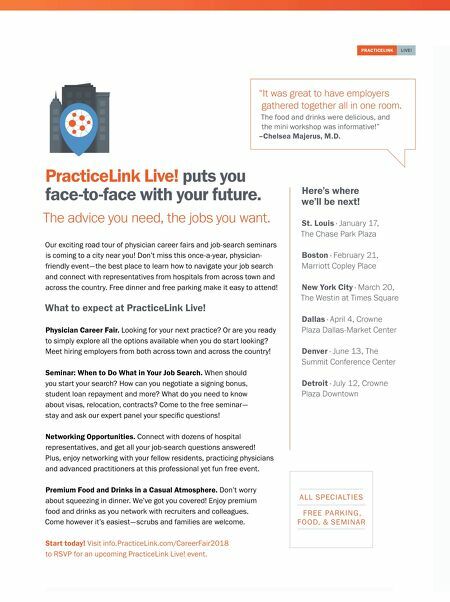 Visit info.PracticeLink.com/CareerFair2018 to RSVP for an upcoming PracticeLink Live! event. Here's where we'll be next! St. Louis · January 17, t he Chase Park Plaza Boston · February 21, Marriott Copley Place New York City · March 20, t he Westin at t imes Square Dallas · April 4, Crowne Plaza Dallas-Market Center Denver · June 13, t he Summit Conference Center Detroit · July 12, Crowne Plaza Downtown A L L S P EC I A LT I E S F REE PA RK I N G , FO O D, & S EM I N A R " i t was great to have employers gathered together all in one room. The food and drinks were delicious, and the mini workshop was informative!" –Chelsea Majerus, M.D. PRACTICELINK LIVE!